The 410-acre The Resort at Longboat Key Club straddles the southern tip of a long, narrow barrier island opposite Sarasota. It consists of two developments: Islandside, which borders the beach and Gulf of Mexico, and Harbourside, a primarily residential enclave, which faces Sarasota Bay. Hotel guests bed down in the 226 rooms and suites in a cluster of midrise towers just behind the beach on Islandside, where there are eight Har-Tru courts, a spa, fitness center, and 18 of the resort's 45 golf holes. However, the focal point of the resort's tennis activity can be found at the $4.5 million Tennis Gardens, three miles away along Sarasota Bay in Harbourside. This handsomely designed facility has 20 Har-Tru courts, one of which is a stadium with seating for 500 spectators, as well as a full service pro shop and an outdoor players' lounge. The USTA named it Facility of the Year when it opened in 2009, and for several years it served as the host site for the Sarasota Open, a men's professional tournament. There are a lot of factors that can go into the success of a tennis program, among them the longevity of the tennis director. John Woods has been in that position since 1976, giving him more than the usual insight into the needs of both club members and hotel guests. He brought strong credentials to the position: He played for Texas Tech and then traveled with the Laver-Emerson camps for three years between stints at the Houston Racquet Club and the Country Club of Sarasota, among other venues. But the physical venue matters as well, and the thoughtful design of the Tennis Gardens makes it not only a inviting place to play but also an appealing place to linger, before and after heading to the courts. Not surprisingly, tennis activity has increased since the Gardens opened. Tennis Programs. Like Palm Beach, Sarasota has a social season from November to April when seasonal residents return and activity on the courts intensifies. During that period, having the eight additional courts at Islandside helps meet demand for the desirable morning time slots. To help shift that demand, Woods began offering more programs in the afternoons, in the way of Cardio tennis, singles strategy, doubles strategy, and live-ball drills. "These are activities people can just drop in on," he notes by way of explaining their success. But he also points to a change in demographics: "We have a younger membership now so the kids are in school so they come out in the afternoons," he continues. "And I think the facility has a lot to do with it also." During the summer and major holidays, he adds junior clinics to the mix. 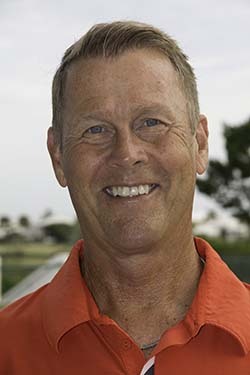 He also praises his staff, which includes Sammy Avila, a near legend on Longboat Key for his years with the Bollettieri tennis academy and then the now sadly shuttered Colony Beach & Tennis Club. Woods has also taken great pains to hire stellar tennis concierges, a position now held by Amy Larson. She grew up in a tennis-playing family in Montana—her father played professionally—and hung around the courts where her father later taught. 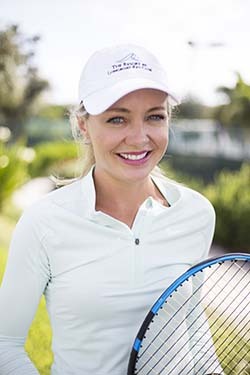 In a way she's still hanging out, though now at the Longboat Key Club's Tennis Gardens, where she spends her days matching guests and members with appropriate opponents or drafting them into round robins. Courts & Fees. There are 20 Har-Tru courts at Harbourside Tennis Gardens and another eight at Islandside. Court fees: None for hotel guests. Beach. The resort lies near the southern end of the 14-mile-long white-sand beach that lines the Gulf of Mexico coast of the island of Longboat Key. The dunes remain intact at this end, so to reach the beach you use any of several walkways. Once there you'll find beach watercraft, lounge chairs, umbrellas, and cabanas. Golf Courses. The resort has 45 holes of golf. Links on Longboat Course: Water hazards come into play on all 18 holes of this 6,748-yard, Par 71 course laid out along the Gulf of Mexico. Pink and white oleander and more than 5,000 palm trees line the fairways, which trail through a bird sanctuary. Harbourside Course: Willard Byrd of Atlanta originally designed the three nine-hole courses—Red Hawk at 3,314 yards, White at 3,342 yards, and the Blue Heron at 3,314 yards—that make up Harbourside. These were later reconfigured by designer Ron Garl, who added more contour and elevation and improved the putting surfaces. Situated on the Sarasota Bay side of the island, these 27 holes trail through stands of live oak, sabal palms, palmetto, and southern pine. Playing here is a different experience from Islandside, at once more open and more trap riddled. Spa & Fitness Center. The 4,000-square-foot Fitness Centre stands just a short stroll from the Islandside lodging at one end of the building containing the golf pro shop and Spike'n Tees open-air restaurant overlooking Islandside's Links on Longboat course. The fitness center consists of an aerobics room with windows on three sides and a mirror on other and views of the Islandside golf course. There are three adjoining rooms offering high-tech cardio equipment, free-weights, and strength training equipment. And ... There is a beachfront swimming pool at the Resort Center, where they occasionally screen movies outdoors. There is also a 291-slip marina on Sarasota Bay in the Harbourside development. The resort lodging consists of a cluster of seven white concrete towers rising from four to 10 stories and constructed in a halo around the Resort Center just behind the dunes lining the Gulf of Mexico beach. Their unprepossessing appearance is deceptive: The rooms themselves turn out to be very spacious—none smaller than a suite—with broad deep balconies or terraces and handsome interiors. The best have views of the beach; the rest overlook the lagoon or golf course. All have full kitchens, washer-dryers, and wired and wireless Internet access. Several dining options are available ranging from formal to poolside casual. At The Resort you will find Sands Pointe, which merges Florida, Mediterranean, and European culinary traditions (e.g., pan-seared black grouper, veal chop with mushroom sauce, Kansas City strip loin) from its perch overlooking the pool and beach. There is also poolside and beachside service from Barefoot's Bar & Grille, and Spike 'n Tees, which overlooks the Islandside Links on Longboat golf course serves breakfast, lunch, and fresh fruit smoothies. Within Harbourside, the choices are Portofino Ristorante and Bar for northern Italian cuisine overlooking the marina and The Tavern & Whiskey Bar in the Harbourside golf clubhouse for farm-to-table fare. Lodging ranges from guest rooms to suites, some as large as two bedrooms. Seasons. Year-round, however busiest from November into April. Travel Instructions. The nearest airport is Sarasota Bradenton International (SRQ), which is 9 miles away and accessible on several national and commuter airlines as well as Canadian Airlines. The alternative is to fly into Tampa International Airport (TPA), 72 miles to the north. Rental cars and shuttles are available at both airports. General Tourist Information. Visit the Sarasota Convention & Visitors Bureau website or contact them at 655 N. Tamiami Trail, Sarasota, FL 34236; (941) 957-1877 or (800) 522-9799, or the Bradenton Area Convention & Visitors Bureau website or contact them at P.O. Box 1000, Bradenton, FL 34206-1000; phone (941) 729-9177.